Ninety-nine percent of all skincare products on the market are created as an emulsion (most commonly, tap water and petroleum-derived oil). And if you look on the label you will see that ‘aqua’ (which is a posh scientific word for water), is usually the first ingredient on the list. These lists are quantitative which means that the ingredients are listed in order of how much each of these ingredients is in the product. As a general rule, the first two to three ingredients usually make up ninety per cent of a product. So when you buy commercial water based skincare, you could be applying a product which is seventy to ninety per cent water to your skin. An expensive and very inefficient way to hydrate! The water content of a skincare product is what the company then sells as its moisturising ability or ‘hydrating’ quality. In fact, a recent advertisement for a very well known petroleum based product (whose name begins with ‘V’ and ends in ‘aseline’), shows a pair of hands catching raindrops with the tagline of the product saying something like “now with twice the hydration of other moisturisers”. But, this is all nonsense! If we could honestly hydrate our skin by applying water to the exterior of our bodies can you imagine what would happen when we sat in a bath? Just think about that for a minute and feel free to laugh yourself into enlightenment. You get into your nice warm bath weighing ten stone and get out weighing about fourty stone; no need to pull the plug out either as you’ve absorbed all that lovely ‘moisturising’ water, haven’t you? Do you see how the skincare industry is making a fortune selling us jars of cheap tap water at grossly exaggerated prices which has no effect on the health of the skin at all? If we could hydrate our skin from the outside then walking in the rain would work wonders. Imagine the strapline for that anti-ageing miracle! The only way to hydrate the skin and keep it healthy, plump and young-looking is to make sure our whole body is hydrated and that requires imbibing enough water and water-rich foods. The body needs two litres of water daily as a bare minimum; in hot weather or if you’re very active this could be three or four litres. And by water I mean actual pure water; not tea, not coffee and not fizzy drinks. You can also get a lot of water from your raw foods too. If you eat a lot of dehydrated raw food you will need to compensate for that, and add extra water to your diet; the same is true of eating cooked foods. Oil is also very important. Our clever bodies use oil and water together all of the time; every cell in the body is dependent on this oil and water combination to structure itself, otherwise we would be shaped like a water balloon. Unlike water, oil can be absorbed into the body via the skin. So if you want to use ‘moisturisers’, then apply those made only from pure plant oils and fats such as coconut oil, making sure you include enough of these in your diet too so you can build those healthy oil and water skin cells. If you’re ever tempted to buy a water based skin product just remember that image of absorbing all your bath water then leave the silly product on the shelf and laugh your way out the door. 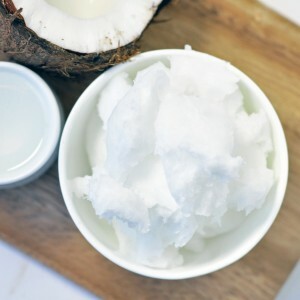 The post Coconut Oil – Nature’s Moisturiser appeared first on Superfood blog - Healthy, Rawfood Lifestyle.